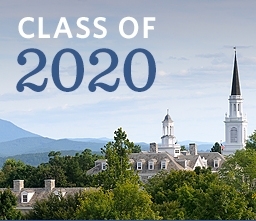 MIDDLEBURY, Vt. – Middlebury College today offered admission to 1,042 students in its regular decision round for the Class of 2020. That brought the total number of admitted students this year to 1,668. In all, this year’s accepted students were selected from among 8,820 applicants, the fourth largest number in the College’s history. The overall acceptance rate, including the early decisions rounds, was 18.9 percent. The students accepted to the Middlebury Class of 2020 are from 49 states (all except North Dakota), Washington, D.C., and 57 countries. The five states with the most admitted students are, in order: New York, Massachusetts, California, Connecticut and New Jersey. Middlebury expects to enroll about 595 students in September 2016 and another 90 in February 2017 as members of the Class of 2020. The College will award about $10.5 million in need-based financial aid to the class, with more than 40 percent of the students receiving support. Students learned of their admission by logging onto a special website starting at 8 a.m. Eastern Time on Saturday, March 19. The College mailed letters to their homes on Friday, March 18. Middlebury will provide admitted students with an opportunity to learn more about the College during Campus Preview Days on April 18-20, when those accepted through regular decision are invited to come to campus, take part in various events, and meet current students and faculty. Admitted students have until May 1 to accept Middlebury’s offer. Correction: This story originally misstated the overall number of admitted students, and the overall percentage of applicants who were admitted. The total number of admitted students is 1,668, not 1,415. The overall percentage who were admitted is 18.9 percent, not 16 percent.